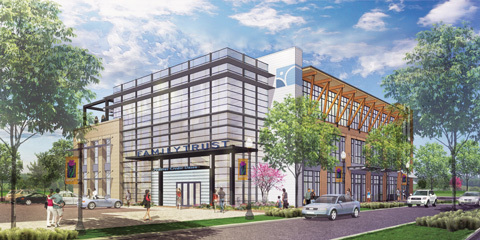 When Family Trust’s new headquarters opens in 2015, art created by Winthrop University students will tell the story of our history and our impact in the community. Five students have been commissioned to create six pieces of art for the lobby, a community room, an employee canteen and the board room. The pieces will be made from a variety of materials, including railroad ties, ceramics, steel, and colored glass, and will reflect Family Trust’s ties to textiles, our core values and service to York County. The new 36,000-square-foot headquarters will bring the heart of the credit union back to its roots when it is constructed on the site of the White Street branch. The three-story building will be the first constructed in the Knowledge Park, an area being redeveloped for jobs, housing and retail between Winthrop University and downtown. Tom Stanley, Chair of the Winthrop Fine Arts Department, and Shaun Cassidy, Professor of Fine Arts, are leading the students. Chelsea Arthur of Greenville is a senior pursuing a Bachelor of Fine Arts (BFA) in general studio, with emphases in sculpture and jewelry/metals. Nicole Davenport of Anderson is a junior pursuing a BFA in general studio, with emphases in sculpture and printmaking. Samantha Oliver of Rock Hill graduated in December with a BFA in ceramics. She is a non-degree graduate student at Winthrop. Christopher Smalls of Beaufort is a senior pursuing a BFA in jewelry/metals. Kaitlyn Walters of Greenville graduated in December with a BFA in general studio, with emphases in photography and sculpture. Meredith Dallas of Rock Hill graduated with a Bachelor of Fine Arts in May 2015 and plans to pursue an associate degree in welding in 2015. The artwork will be finished by early May and stored until the building opens. In the meantime, White Street road improvements are underway and construction begins this spring. The branch is expected to close sometime in September.